Join sculptor Dale Lamphere and Etch Your Name in History! The Arc of Dreams will be completed and installed this May! There's still time to have your family's name etched on the donor wall and be a part of history. You can make your donation online or simply print the pledge card and mail to SculptureWalk's Arc of Dreams, 300 South Phillips Ave #L104, Sioux Falls, SD 57108. Or call 605-838-8102. 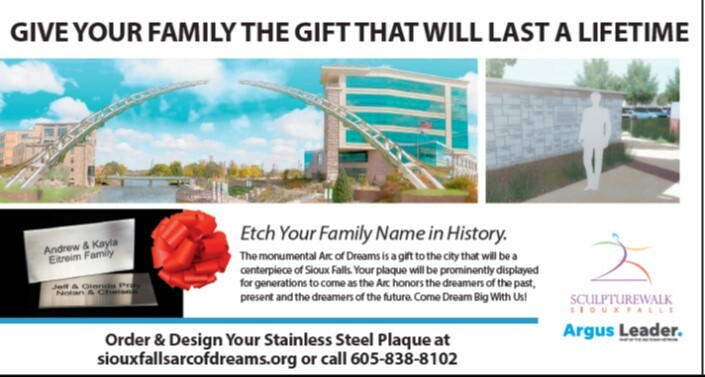 We're calling this idea the Arc of DreamsTM, a massive stainless steel sculpture that will span across the Big Sioux River downtown nearly the length of a football field between 6th and 8th streets. At the center of the Arc of Dreams is a 18-foot gap, 70 feet above the river, representing the leap of faith dreamers take to see their dreams come true. "The Arc of Dreams is the SculptureWalk capstone, recognizing and elevating this art program to national prominence," said Jim Clark, SculptureWalk founder and the thrust behind the Arc of Dreams. It will become a signature piece of art for the city of Sioux Falls, helping to illustrate what we want to be… a unique and thriving modern city on the prairie.